Discover the heart of Pearl, MS. It's the newest modern and upscale hotel that places you in the epicenter of a vibrant environment located off of interstate 20. 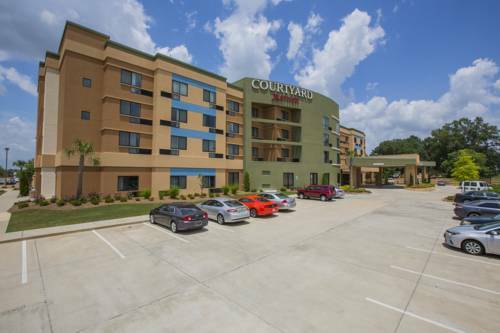 The Courtyard sits in the heart of the city's most energetic district surrounded by restaurants, next to Tinseltown Movie theater and walking distance to Bass Pro Shop, MS Braves Baseball Stadium, and the Outlets of Mississippi. Furthermore; we are only a 10 minute drive to Downtown Jackson and Shiloh Park Baseball Stadium. You'll also enjoy our flexible spaces where you can work or relax, free Wi-Fi throughout the hotel and easy access to the latest news, weather and airport conditions via our GoBoard technology. Plus, our well-equipped fitness center, outdoor pool and patio will help you stay refreshed and energized. Whether traveling for business or pleasure, your stay at Courtyard is sure to be more comfortable. You must be 21 of age to check-in. Cash deposit is required if paying with cash. Be advise this hotel has a 48 hour cancellation policy.